adsquare offers brands insights into customer behaviors and footfall to underpin digital marketing campaigns. 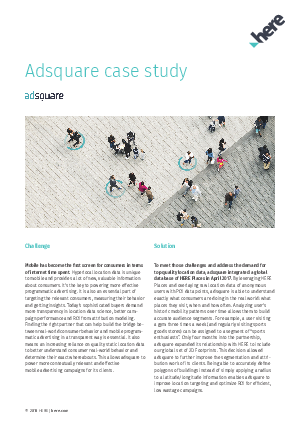 Using a detailed brief of the audience the brand wishes to reach, adsquare gathers data from a range of mobile, online and offline sources. This rich data gives a brand a stronger opportunity to create relevant campaigns for their audiences.